In late January, classroom based competitions were held to determine the top spellers from each of our First Year groups. Our top 20 spellers then contested a 'Spelling Bee' on 10 February 2019, held in the Lecture Theatre. Our finalists were cheered on by their classmates who made up the audience! The 20 finalists were soon whittled down to the final three students, as they faced the tricky task of spelling words such as 'coniferous', 'queuing' and 'irresistible'. Well done to the runner-ups who were Clodagh Callanan and Rachel Dufficy, while the winner and newly proclaimed 'Queen Bee' was Saoirse Mullen. Mr Montgomery would like to thank his 5th Year class (5Q) for all their help in organising the competition, as well as to Ms Doherty, Ms Fields, Ms Dunwoody and Ms O'Neill for their support. We have a Queen Bee! In late November 2015, all 1st years in Manor House were given the opportunity to practise their spelling skills in a class test conducted by their respective English teachers. The students were asked to spell a number of words, based on keywords from their common subjects (i.e. English, History, Geography, CSPE, Religion and SPHE). 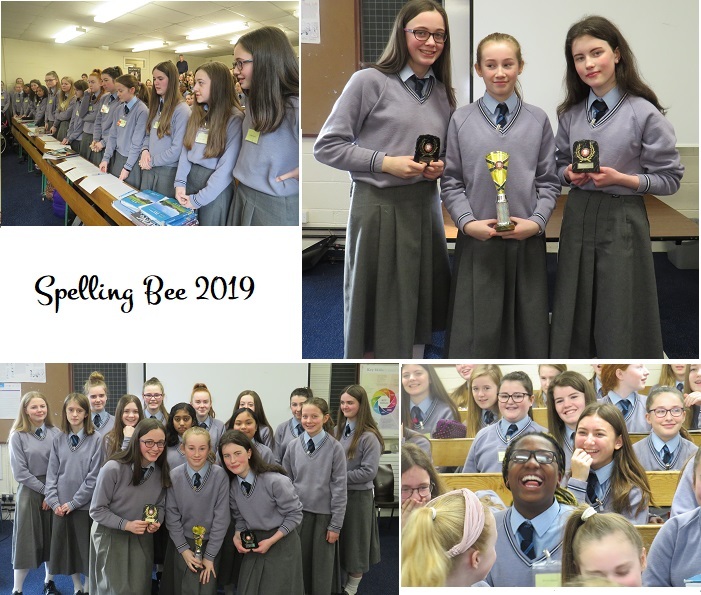 Following these class tests, twenty students (four from each class) qualified for the 'First Year Spelling Bee Final’, which was held on Tuesday 26 January, in the Lecture Theatre. Supported by their class mates and English teachers, each of the finalists were asked to spell a keyword, in order to advance to the next round. All the students breezed through the first round! However as the rounds progressed, eventually the field was whittled down as words such as 'Exaggeration', 'Deciduous' and 'Mediterranean' got the better of the contestants! In the end, we were left with our top three spellers; Ciara Fox (3rd place), Robyn Graham (2nd place) and Aisling Murphy (1st place). Well done to all 1st Years for participating in the event and a very special congratulations to Aisling who is now our 1st Year ‘Queen Bee’ for 2015-16. This event was organised by a TY class group (4S) under the guidance of Mr Montgomery. The TY students undertook the organisation of this event in order to complete their course on ‘Project Management’, so well done to all the girls involved in this. Special thanks must also go to the 1st Year English teachers for their cooperation and to Mr Beirne, Ms Dunwoody and Ms O’Neill for their support on the day. The annual 1st year Spelling Bee took place on Friday 10 March. Below are pictures of the participants, the winner, Rachel McKenna and the other two finalists, Ella Connolly and Lila O'Malley. Well done to all who participated and to all of the helpers!